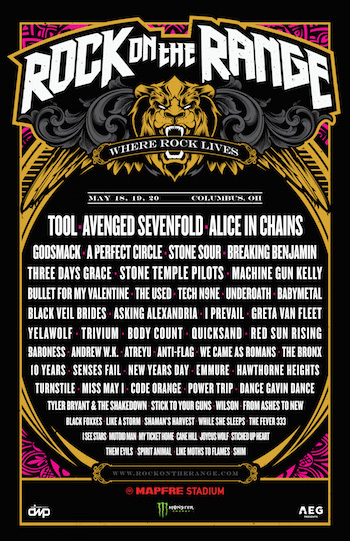 The 12th annual Rock On The Range returns to MAPFRE Stadium in Columbus, OH Friday, May 18, Saturday, May 19 and Sunday, May 20 with its most power-packed lineup to date. America's largest and most acclaimed rock festival features nearly 60 bands on three stages, led by Tool, Avenged Sevenfold, and Alice In Chains, also featuring Godsmack, A Perfect Circle, Stone Sour, Breaking Benjamin, Three Days Grace, Stone Temple Pilots, Machine Gun Kelly, The Used, Bullet For My Valentine, Black Veil Brides, and many more. Many of the biggest names in rock will be joined by some of rock's most exciting up-and-coming talent such as Greta Van Fleet, Code Orange, Power Trip, and New Years Day. 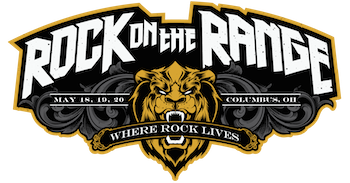 Rock On The Range also showcases rock's favorite comedians in the ROTR Rolling Rock Comedy Tent, and the festival includes various onsite experiences during the three-day weekend. The comedy lineup will be announced in early 2018. Rock On The Range continues to grow year after year and draws attendees from around the world. 2017 was the festival's biggest year to date with a crowd of 135,000 in attendance; tickets sold out just a month after going sale, marking the festival's fifth consecutive advance sell-out. M. Shadows of Avenged Sevenfold said, "Rock On The Range is the undisputed champion of American rock festivals. The team over there has done an incredible job of curating a potent mix of all the types of rock 'n roll that any fan could ask for. It's an honor to play at the top of the bill, and we cannot wait to see everyone in May." "We are looking forward to returning to Rock On The Range as a headliner this year and rocking out with all of you. Bring It!" said Jerry Cantrell of Alice In Chains. "Following last year's amazing festival we knew we had to deliver. We have one of the only shows from Tool in 2018, a band the Rangers have been wanting for years — and also having A Perfect Circle on the same festival is something special. Adding Avenged Sevenfold, Alice In Chains, Godsmack, and the special returns of Stone Sour and Stone Temple Pilots only builds on that excitement. We can't wait for May," said Gary Spivack, Executive Producer for Rock On The Range. The current music lineup for Rock On The Range 2018 is as follows: Tool, Avenged Sevenfold, Alice In Chains, Godsmack, A Perfect Circle, Stone Sour, Breaking Benjamin, Three Days Grace, Stone Temple Pilots, Machine Gun Kelly, Bullet For My Valentine, The Used, Tech N9ne, Underoath, BABYMETAL, Black Veil Brides, Asking Alexandria, I Prevail, Greta Van Fleet, Yelawolf, Trivium, Body Count, Quicksand, Red Sun Rising, Baroness, Andrew W.K., Atreyu, Anti-Flag, We Came As Romans, The Bronx, 10 Years, Senses Fail, New Years Day, Emmure, Hawthorne Heights, Turnstile, Miss May I, Code Orange, Power Trip, Dance Gavin Dance, Tyler Bryant & The Shakedown, Stick To Your Guns, Wilson, From Ashes To New, Black Foxxes, Like A Storm, Shaman's Harvest, While She Sleeps, The Fever 333, I See Stars, Mutoid Man, My Ticket Home, Cane Hill, Joyous Wolf, Stitched Up Heart, Them Evils, Spirit Animal, Like Moths To Flames and Shim.